This morning, an as-yet unidentified man entered Los Angeles LAX airport and opened fire, killing one TSA agent and injuring approximately 13 others. Initial reports suggest he may have been targeting TSA agents. I warned of the possibility of a mass-murder event four days ago, based on the astrological weather. 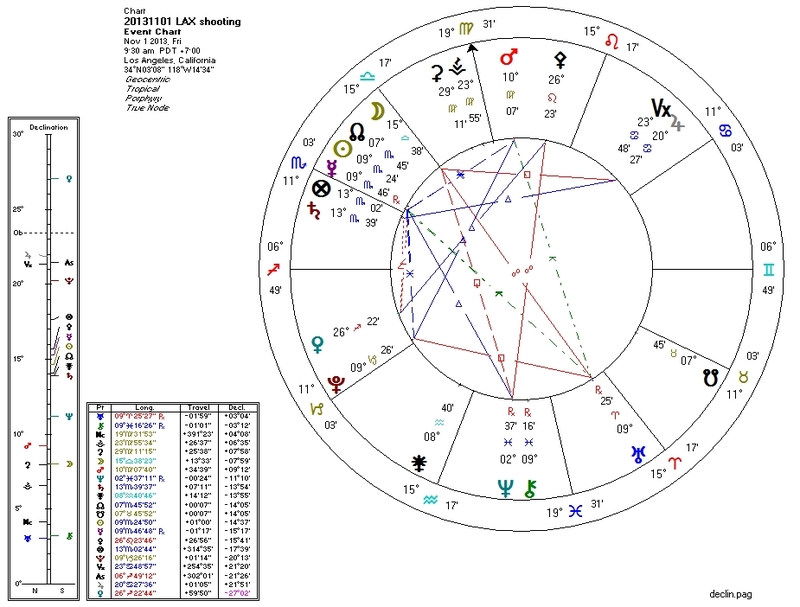 Pallas, protector of libertarian non-aggression, is still within the orb of the same aspect with Pluto I reported on then -- her ability to maintain peace is compromised when Pluto is in orb. As always with these events, we look for the Bloodbath Formula. 1. Pallas sesquiquadrate Pluto. Ethics compromised by power. 2. Saturn (Second House ruler) widely square Neptune; Jupiter (ruler of Venus) quintile South Node. Property rights, including possession of one's own body, compromised. 3. Pluto conjunct the Second House cusp, widely conjunct Venus, and widely opposite Venus' ruler Jupiter. Property destruction, again including human bodies. 4. Pluto square Moon. Death of family (fellow humans). 5. Pluto sextile Sun and trine Mars (co-ruler of Sun). The day brings death. 6. (optional) Prominent Mercury, conjunct the Sun. I can't explain this one: it just appears very often. The formula is fully present, and so a mass-murder event on this day is no surprise to any astrologer who has learned the formula. This formula, and the Pallas-Pluto aspect in particular, were how I was able to suggest in a previous post that there could be another mass-murder this week. Anyone with the patience to learn can use these techniques. Pallas rules, among other things, non-aggression. She is the ruling planet of libertarianism. When she is compromised, violence and tyranny are empowered. http://www.cnn.com/2013/10/31/world/meast/syria-civil-war/ Today's Israeli attack on Syria (woefully under-reported) may also correspond to the astrological configuration of today.